With a consistent pressure for organizations to keep up with latest technology trends and react quickly to the competition, one need an IT partner with extensive domain expertise and well-defined strategies. IoT, Mobility,Cloud Computing are changing the business landscape at lightning speed. With a consistent pressure for organizations to keep up with latest technology trends and react quickly to the competition, one need an IT partner with extensive domain expertise and well-defined strategies. 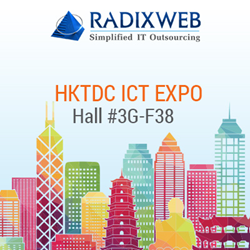 Radixweb, the industry leading Enterprise Software Development and IT Outsourcing Company to help HKTDC ICT Expo 2016 attendees define, design and implement IT strategies that drive business growth at Hall 3G Stand F38. Asia’s leading ICT show – HKTDC showcases the newest products and solutions in information, communication and technologies to help SMEs to maximize efficiency and minimize cost. Happing on April 13-16 2016, the show will once again gather the industry experts and leaders of innovative technology from around the world to interact and share insights. “We recognize the emerging need to keep up the pace with IT trends and our commitment is to help businesses embrace change. We help companies find a balance between excellence, innovation and cost. Our offerings in Enterprise Software Development and IT outsourcing have been designed by nearly 15 years of experience delivering value to our customers, and are built on extensive technology expertise, market trends and business need. At Hall 3G Stand F38, we will help businesses to discover new opportunities and navigate IT change with confidence,” said Dharmesh Acharya, COO, Radixweb. The company will also exhibit its industry-specific expertise for Insurance, Field Service Management, Printing and HR & Recruitment. Businesses from these domains will have a chance to discuss current challenges and receive the personal consulting to implement right IT strategy in place. Established in 2000, Radixweb is a leading software product development and IT Outsourcing services provider. The company delivers a complete range of IT services and enterprise-class solutions to clients from SMEs to fortune 500 companies across the globe. Radiweb key Service offerings include Bespoke Software Development, Embedded Software Development, Software Product Development, Web & Desktop Application Development, Application Performance Optimization and more. Due to consistent and reliable service delivery, the company earned credentials like Microsoft Gold Partner, Kentico Bronze Partner, nopCommerce Partner, ISO Certification for quality processes and Adobe Solutions Partner. For details, please visit http://simplified-it-outsourcing.com.